It's GOLD -- BIC's second ONE Show Pencil in two years. For the second year in a row and besting well-established college programs, a BIC team has been awarded The ONE Club's highest honor: the GOLD Pencil. The BIC team of Enmanuel Vargas, Yulia Lesnichaya, Surabhi Govindarajan, and Tung-Han Lin has won the 2017 Young Ones Competition GOLD Pencil in the Social Impact category for “VIDEALL,” a partnership proposal between two tech giants: Google’s Chrome browser and Microsoft’s Sign Language Translator. VIDEALL is a plug-in that converts audio, subtitles or closed captioning from online video into sign language which will bring digital inclusion to the 360 million hearing impaired. The BIC team of Sean Feol-Baugh, Kacy Charles, Fidel Frias, and Joseph Yoo have won a 2017 MERIT award for “Three to Free,” a one-of-a-kind partnership between five of the world’s largest telecoms companies to help stop human trafficking. Facilitated by Partners Global, their proposal tasks telecoms with rolling out the latest generation of emergency call tracking to create a single international emergency call number: 323. The service will automatically direct calls based on the country of origin to local law enforcement with specific location data so that all users may speak to someone in their native language. Individuals do not even need to speak to activate this service. The awards were given during an SRO crowd at The One Show's YO Ceremony at Google event space on Tuesday evening, May 9th. Nearly 15 BICsters filled the space and added color to a boisterous celebration. According to One Club President Kevin Swanepoel, this year's winners were chosen from its largest pool of international submissions ever (from Milan to Mumbai, Rio de Janeiro to Stockholm) by a jury of top industry professionals and educators. It was a busy day. 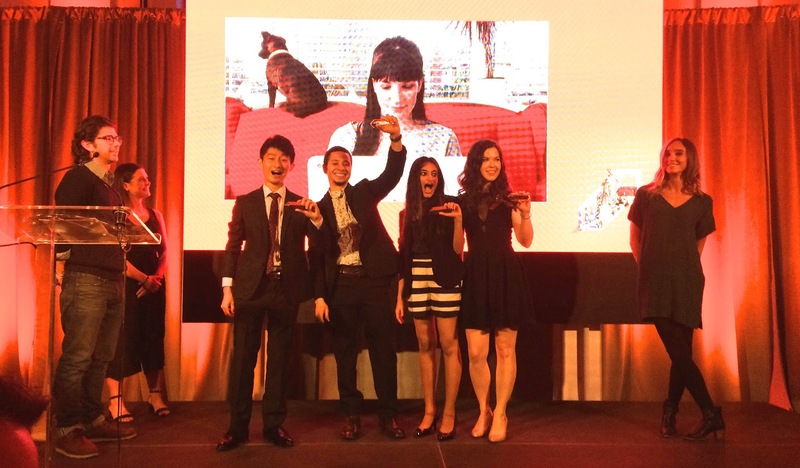 Earlier, two BIC teams (that included two undergrads) were among 9 finalists in the Client Pitch presentation where they showcased their social impact campaigns to judges from Partners Global Partners, the United Nations and BBDO. Henrik Bakke-Hareise, Carmen Quang, and Francesco Rizzo pitched "Donuts for Peace" which partners Dunkin Donuts and the Council on American-Islamic Relations to bring common values to American consumers in a truly delicious way. Alex Elkonina, Tannya Luna, Michael Mangal, and Nilda Valdez pitched "Mission Monkey Bars" which partners Little Tykes and the US Army to provide playgrounds to refugee children as a fundamental right to play. A BIG BIC congrats to all the BIC teams with kudos going to the awesome guidance and support of BIC instructor Jason Stefanik and BIC Creative Track Director Gerardo Blumenkrantz. 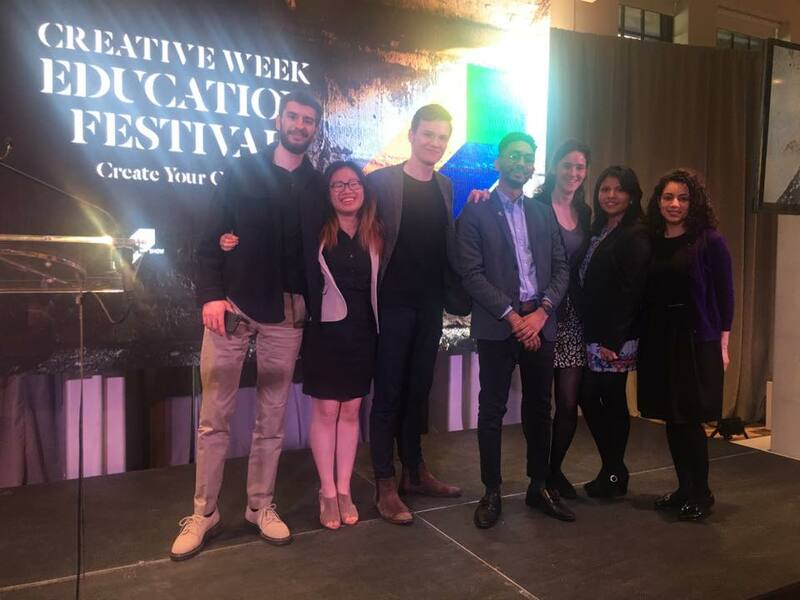 More about Creative Week: this year, it was held from May 7-12 in New York. It is the preeminent festival showcasing the intersection of advertising, innovation and creative thinking. Home to The ONE Show, Young Ones Competition, The ONE Show Creative Summit as well as networking and learning events that highlight the power of creativity, it will attract thousands of creative types from all over the world. More about The ONE Club: The One Club exists to champion and promote excellence in advertising and design in all its forms. It is the world's foremost non-profit organization devoted to elevating creative work in the industry. It seeks to celebrate the legacy of creative advertising and to use that legacy to inspire future generations. The One Club is the 'keeper of the flame' for advertising creatives. The One Show remains the pinnacle of achievement by providing a showcase of the world’s best work, and by inviting collaboration among individuals who are actively developing outstanding work. Further, The One Club exists to educate and inspire students of the business and to benefit the next generation of creatives through scholarships, portfolio reviews and annual student exhibitions and competitions.